SUMMARY: Tangrams are seven shapes cut from a single square. This app is full of geometric puzzles and challenges. The user will rearrange the shapes to create the picture displayed on the screen. 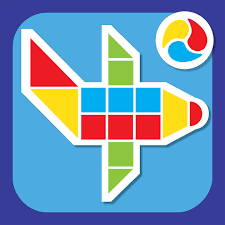 This app is great for developing knowledge of shape and also spatial awareness. TOP TIP: As with many free apps, there are only a certain number of levels that you can access without paying for the app. However, the free levels give you a good taster for the game, leaving you to decide whether you wish to purchase it.